Does Maha Mrityunjaya mantra work? Many people ask me this question, ''Does Maha Mrityunjaya mantra work?''. Mantras always work but the problem is that we are often not open to believing this. The query about whether the Maha Mrityunjaya mantra works comes in different forms, sometimes by email, in the comments section or in person. Most people are curious, some are interested but few are committed to sincerely want the answer. I am just an ordinary seeker on the spiritual path but my experiences have taught me valuable lessons and I am sharing this with you so that it helps your spiritual progress. My gut feel is that chanting a mantra should not be with an intention of ''What can I get in return" but with an intent to replenish our thoughts and actions with a larger consciousness, the energy and the spark of the Divine. Are you ready to get started? Okay, then here's how we can get started. Chanting the Maha Mrityunjaya mantra is easy, here is a step by step guide to help you know each word and understand the meaning of the Maha Mrityunjaya mantra as you chant it. Day after day, you can practise and chant this mantra whenever you have time - on your way to work, after boarding the Metro, before your first meeting of the day, just before you go off to sleep in the night and so on. Nourish the Maha Mrityunjaya mantra mantra within you so that it journeys with every moment of your daily life. 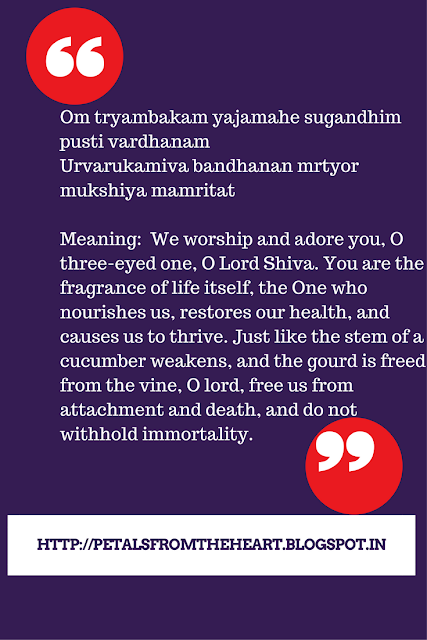 The Maha Mrityunjaya mantra is ancient, powerful and can transform the quality of your life in leaps and bounds. The most important thing to keep in mind is this: Be sincere in your efforts. Have faith. The Maha Mrityunjaya mantra will work. The important thing is to get started ASAP. If you found this post useful, share this article on your social networks, let more people know and chant the mantra. Remember, the good that you share always protects you, so do share this with everyone you know. Good point on mantras in general about not doing it for the sake of getting something in return but for greater divine consciousness. Exactly my feeling too. Totally agree with your point of view, Vishnu. Maha Mrityunjaya Mantra gets lots of benefits like mental stress, depression, physical health, family issues. The way you have answered your own question is soo nice and appreciatable. If you want to know the Benefits of Mahamrityunjaya just click on the link.